The DIV-Net: Bought 47 shares of NKE at $52.84 per share. Bought 47 shares of NKE at $52.84 per share. With this buy, DivGro's projected annual dividend income increases by $30.08. 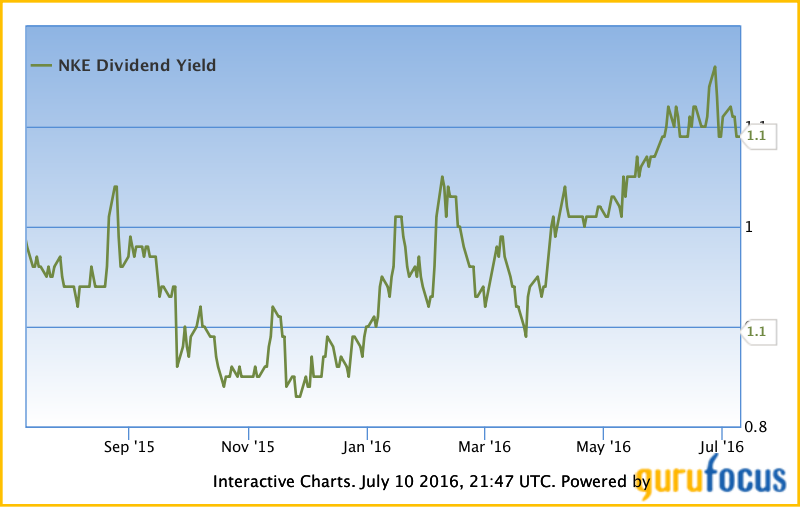 NKE's trailing annual dividend yield is near a 1-year high. I was fortunate to lock in an initial yield on cost (YoC) of 1.21%. 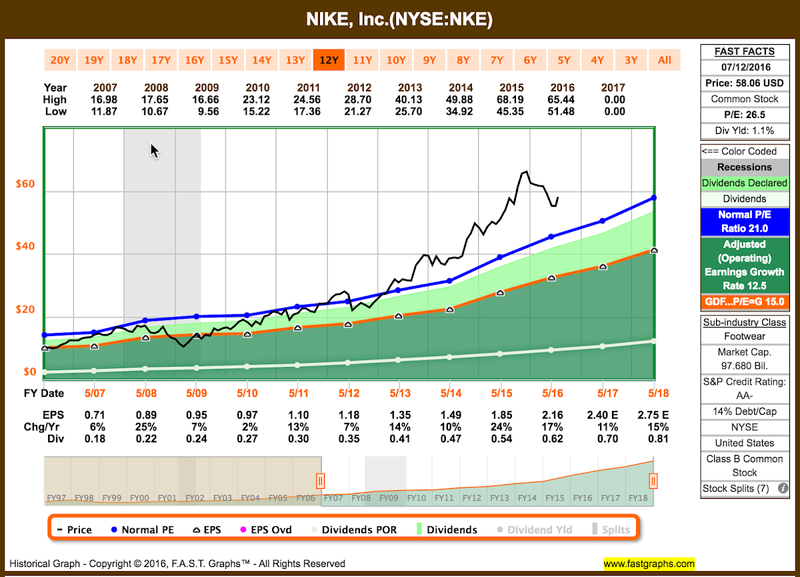 (NKE's share price now trades near $58, which means the stock yields 1.10%). NKE has paid 128 quarterly dividends through the end of 2015 and 2 additional quarterly dividends of 16¢ per share so far this year. Here is a chart showing the quarterly dividends paid by NKE since January 2000. NKE continues to increase its dividend at a steady pace and it is clear that the dividend is easily covered by both EPS and FCF. Presently, the TTM (trailing twelve month) EPS payout ratio is 30%. The company's 10-year price history is shown in the following chart, along with my buy price. NKE has outperformed the S&P 500 by about 400% in the last decade! 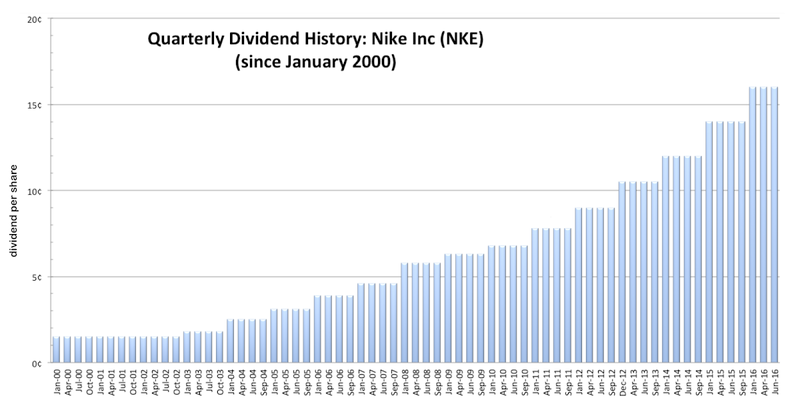 Because NKE pays dividends, the picture looks even better if we include dividends. According to longrundata.com, an investment in NKE 10 years ago would have returned 20.5% on an annualized basis with dividends reinvested. My fair value estimate for NKE is $55.27. I use a multi-stage DDM (dividend discount model) analysis with proprietary adjustment to determine fair value. For comparison, Morningstar's fair value estimate is $57 and S&P Capital IQ's fair value calculation is $58.60. According to TipRanks, based on 22 ranked analysts offering 12-month price targets for NKE in the last 3 months, the average price target of NKE is $64.39. The fundamental analysis tools available at finbox.io provide a comprehensive list of stock valuation models and a quick way to view the average fair value estimate of several models given default settings. 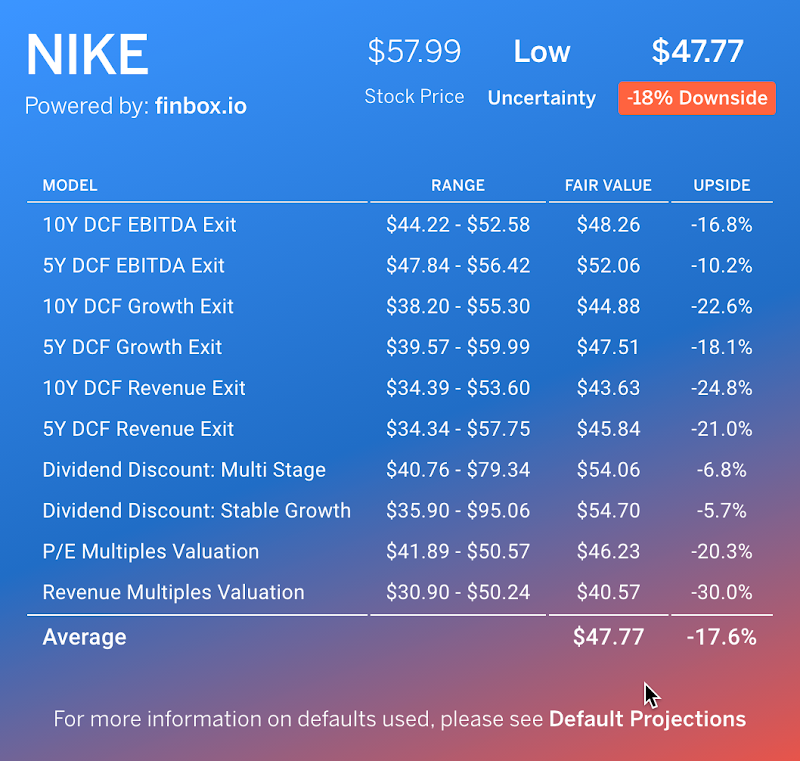 According to finbox.io, the average fair value for NKE is $47.77, implying a downside of 18%. Finally, the following earnings and price correlated F.A.S.T.graphs chart for a 12-year period indicates an estimated price of $57.80 for the Normal P/E Ratio of 21.0 for NKE. Excluding the highest and lowest of these fair value estimates and using the average of the remaining values, I get a fair value estimate of $57.17. My buy price of $52.84 implies a discount to fair value of 7.57%. The following table provides some key statistics for NKE, with highlighted values relating to my selection criteria. Data sources include the CCC spreadsheet, Finviz, and gurufocus. While NKE's dividend yield is way below what I normally look for in dividend growth stocks, the company's dividend growth rate is impressive. And with a dividend payout ratio below 30%, the company should be able to continue growing its dividend at a healthy pace. 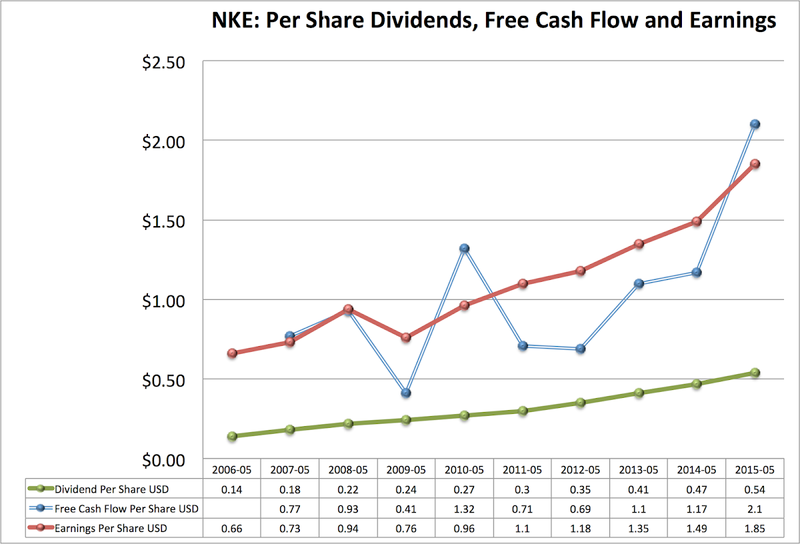 In addition to dividends, NKE is showing its shareholder-friendliness through stock buybacks. In fiscal 2016, the company bought back 55.4 million shares for about $3.2 billion. In November 2015, the company approved a new $12 billion buyback plan. In fiscal 2016, the company earned $2.16 per share, which represents year over year growth of 17%. Revenues rose 6% to $32.4 billion, up 12% on a currency-neutral basis. According to Nasdaq, analysts are expecting NKE to grow earnings by 11% in 2017. Risks include currency headwinds and intense competition from the likes of Adidas, Puma and Under Armour. Changes in consumer preferences and tastes are risk factors too. Economic downturns could hurt results as more frugal customers shy away from increasingly expensive products. As mentioned earlier, NKE was the top ranked stock in the June edition of my 10 Dividend Growth Stocks series on Seeking Alpha. The stock beat out two other Consumer Discretionary sector stocks, Target Corporation (TGT) and Ross Stores, Inc (ROST). I'm own TGT but not ROST. 47 shares of NKE adds $30.08 to DivGro's projected annual dividend income. I updated my portfolio to reflect this recent purchase.